Drawing profile pictures on the floor. 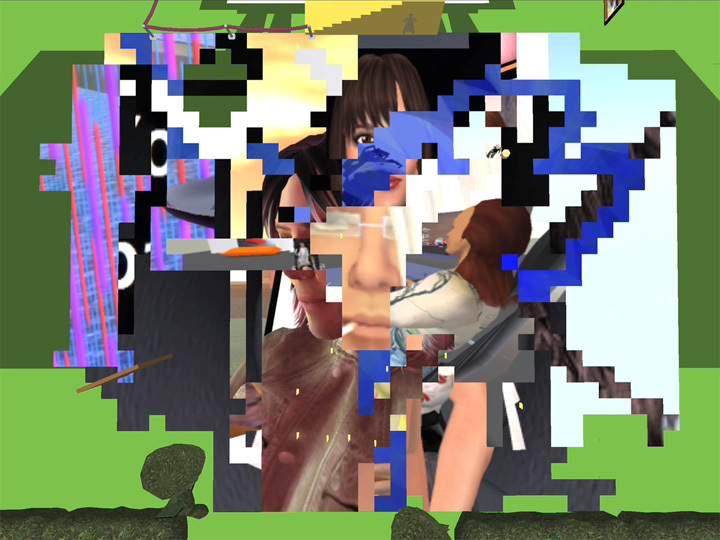 An installation in Second LIfe. A large floor-surface is sensible to user-interaction: Whenever an avatar walks over a part of this surface, then that part (a tile of 1 x 1 m2) will display a part of that avatars profile picture. The drawings will remain even after the avatar has left, so other avatars visiting later will be able to see the traces made by previous visitors. Traces is an attempt to make us sensible to the most natural and real element in Second Life: Human behavior. Traces consist of a homogenous, totally undifferentiated space which will slowly get its shape by the way the visitors move through this space. By itself it will try to have as little character as possible and thus it will make visible this uncontrollable and unknowable human element, the way we interact with our environment, as much as possible. Exhibited in Second Life in the Brooklyn Is Watching sim.